EEA Family Permit stands for European Economic Area Family Permit. An EEA family permit is a form of entry clearance that is provided so that family members who are not EEA nationals (citizens) can travel with an EEA national or join him or her in the United Kingdom. An EEA Family Permit is an immigration document that allows a non-EEA national to enter the United Kingdom and reside there on the basis of being a dependent of a citizen of the European Economic Area (EEA) or Switzerland. 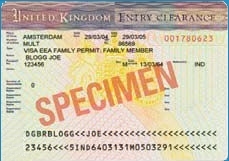 Non-EEA family members (the spouse, civil partner or dependent child) need an EEA Family Permit if they would normally need a visa to travel to the UK, or if they are coming to live with an EEA national to the UK permanently (for the definition of EEA national, see here: Who is EEA national). An EEA Family Permit is a document issued under the authority of free movement provisions of the Treaty of Rome and European Law, and therefore an EEA Family Permit does not have the status of visa. Visa is issued by a particular country (domestic immigration regulations) as compared to an EEA Family Permit which is issued under the European community law. What is an EEA Family Permit good for? An EEA Family Permit allows unrestricted employment and residence in the UK for the duration of the EEA Family Permit. If you are able to demonstrate that you have been living in a relationship akin to marriage with an EEA citizen, you may be eligible to apply for an EEA Family Permit. The condition is that you need to have lived with the EEA citizen for the most recent two years. An EEA Family Permit for married is intended for individuals who are married to an EEA citizen. The EEA-national partner must be exercising his or her Treaty rights in the UK (i.e. self-employment, study, employment, etc.). The non-EEA family member and the EEA national must either be legally married to each other (married couples) or be able to provide evidence of living together within the most recent two years (unmarried couples). The non-EEA family member and the EEA national must have met already. The non-EEA family member and the EEA national must demonstrate intent to live together. The non-EEA family member and the EEA national must be travelling to the UK together, or the EEA national should already be in the UK. The family unit must not be dependent on public funds whilst in the United Kingdom. Application for an EEA Family Permit is submitted to the UK Border Agency (see www.ukba.homeoffice.gov.uk). EEA Family Permits are then available from any Entry Clearance Issuing Posts outside the UK (usually UK Embassies or Consulates). How long an EEA Family Permit is valid for? An EEA Family Permit for the EEA-national partner is usually issued for 6 months. It is expected that in the course of those 6 months the EEA-national partner applies for a Residence Permit from the UK Border Agency (or through the British authorities in the non-EEA partner's home country in case he or she it not yet present in the UK). The EEA Family Permit for the non-EEA family member is usually issued for 5 years after which the non-EEA family member applies for an Indefinite Leave to Remain (permanent residence). How much does EEA Family Permit cost? An EEA Family Permit is issued free of charge. If you are a non-EEA family member living together with an EEA national and seeking the EEA Family Permit, and your EEA-national partner does not hold a current UK Residence Permit, you would apply for a 5 year EEA Family Permit. In addition to that, you and your EEA-national partner would file a joint application for a Residency Permit to the UK Border Agency Home Office. Does an EEA Family Permit authorize me to work? In general, if the EEA national is a qualified person in the UK, his or her family members are not required to register under the Worker Registration Scheme and the EEA Family Permit serves the purpose of work authorization. Does an EEA Family Permit holder need to register with police? Family members holding EEA Family Permit do not need a registration certificate; therefore, they do not need to register with the UK police. Does an EEA Family Permit holder need a residence card? Once a non-EEA family member holds a valid EEA Family Permit, obtaining a residence card from the UK Border Agency is not necessary. It is optional. Non-EEA family members can, if they want to, apply for a residence card once they are present in the UK. A residence card only confirms that the holder has the right to reside in the UK on the basis of being a family member of someone having the right of residence. Does an EEA Family Permit holder need Schengen visa? Schengen visa applies to the Schengen zone. United Kingdom has not joined the Schengen zone; therefore, EEA Family Permit holders do not need Schengen visa. What comes after the EEA Family Permit? The EEA Family Permit is a temporary document on the path to a permanent residency in the UK. After spending 4 years and 11 months in the UK on EEA Family Permit, the non-EEA family member is eligible to apply for an Indefinite Leave to Remain (permanent residence). Although Switzerland is not a member of the EEA, an EEA Family Permit applies to dependents of citizens of Switzerland as well. Switzerland citizens and their family members have the same rights as EEA nationals and their family members. In general, although the UK is also a member of the EEA, an EEA Family Permit does not apply to UK citizens and their family members. In general, an EEA Family Permit applies to EEA nationals other than UK citizens applying for their non-EEA family members. The exception is that if a British citizen is living in another EEA country, his or her non-EEA family members can apply for an EEA family permit to join him or her on their return to the UK. extended family members (in some circumstances). More information about an EEA Family Permit can be found in the governing Directive 2004/38/EC of the European Parliament and the Council of 29 April 2004 on the right of citizens of the Union and their family members to move and reside freely within the territory of the Member States. An EEA Family Permit is a document used by family members of EEA (European Economic Area) citizens to legaly reside in the United Kingdom.